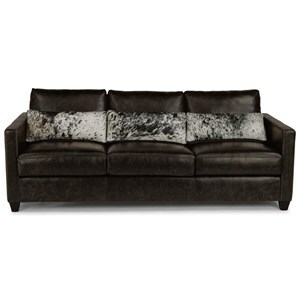 Your home is sure to make a statement with this contemporary upholstered sofa. The sofa showcases a clean, straight line design with its track arms, chrome rectangular legs, and firm cushions that enhances the sophisticated quality of the room. 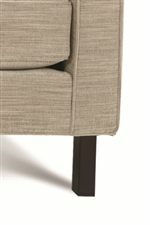 For added interest, welting around the cushions and button tufting on the back pillows have been included on the upholstery. 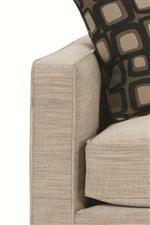 This sofa is just as trendy as it is comfortable. 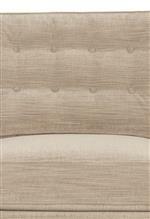 Your whole family will love it with its crisp and clean nature and polished look. 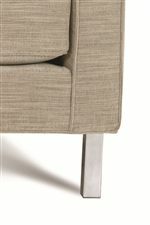 The Abbott Upholstered Three-Seat Sofa with Chrome Legs by Rowe at Reeds Furniture in the Los Angeles, Thousand Oaks, Simi Valley, Agoura Hills, Woodland Hills, California area. Product availability may vary. Contact us for the most current availability on this product.